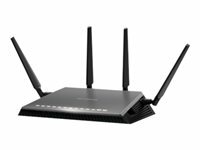 Nighthawk® 8-Stream AX6000 WiFi Router is powered by the industry’s latest 802.11ax WiFi standard with 4 times increased data capacities in a dense environment to handle today and tomorrow’s growing home network. Blazing-fast combined WiFi speeds up to 6Gbps and AX optimised 64bit 1.8GHz Quad-core processor powers smart home automation, ultra-smooth 4K UHD streaming, online gaming, and more. Introducing AX WiFi—the latest generation of WiFi that delivers four times better performance than AC WiFi. With innovative technologies, such as Orthogonal Frequency-Division Multiple-Access (OFDMA), 4x4 Multi-User MIMO, and intelligent scheduling, AX WiFi delivers a huge boost in speed and total capacity. Rising to the challenges of modern smart home demands, this new standard of WiFi is ready to support more devices with better reliability and faster speeds. Powerful Processor—64bit 1.8GHz quad-core processor ensures smooth 4K UHD streaming and gaming. Multi-Gig Internet Support—Aggregate two gigabit Ethernet ports to get multi-gig Internet speeds, where supported. Orthogonal Frequency-Division Multiple Access (OFDMA) substantially improves the network capacity and efficiency. Facilitates efficient data transmission for up to 8 devices at the same time & improves upload speeds over WiFi. Extreme speed Speed makes HD video better. Speed makes online gaming awesome. Speed makes all your devices really go. And anyplace you need speed, with NETGEAR you got it. Extreme download speeds up to 300+900 Mbps. 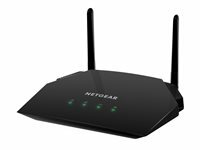 Next-generation 11ac Wi-Fi with dual band technology providing whole home coverage with Gigabit wired and wireless connection. Everything you need for a fast, fast, fast connected home. Wi-Fi range Homes come in all shapes and sizes. 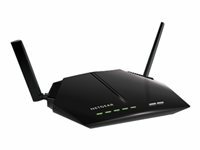 The NETGEAR AC1200 Wi-Fi High-Speed DSL modem router with additional high-power amplifiers provides Wi-Fi connectivity throughout your home for all your Internet-enabled devices. Ultimate reliability Stay connected - with your devices, your media, and your friends. Simultaneous Dual Band Wi-Fi provides two separate Wi-Fi networks - 2.4 GHz for legacy devices and 5 GHz which is less interference-prone for media streaming. The advanced QoS technology provides higher priority for media streaming application for smoother HD video streaming and low-latency online gaming. Easy sharing Relive memories and share them with others. Find photos, videos and music stored on a shared USB hard drive and enjoy them on your DLNA TV right from your couch. If it's secure and shared storage access you want, NETGEAR has easy ways to do it. Secure experience Keep your Internet browsing experience safe and secure with the free parental controls. It allows you to limit access to certain web sites at certain times. For example, no social networking or gaming site access after dinner time. Guest networks create a completely separate Wi-Fi network for your guests' devices, ensuring they do not have access to your home network or to the shared USB hard drive with all your personal data. Secure Wi-Fi connections offer high level WPA/WPA2 security. 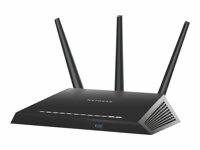 Wide Wi-Fi range The NETGEAR AC1600 smart Wi-Fi router provides Wi-Fi connectivity throughout your home for all your Internet-enabled devices. Reliability There's nothing more frustrating than lost connections! With NETGEAR's advanced features & technology, you'll reduce interference & enjoy more reliable Wi-Fi connectivity. Easy sharing With NETGEAR, sharing across your network is fun and easy, anything from accessing stored photos & music. Ease of use Start enjoying your device faster than ever. NETGEAR wants to make sure installation and management is simple & easy, so you can connect quickly & make sure you stay that way! Enjoy lag-free gaming with the ultimate in AC speed & performance. Nighthawk delivers AC1900 WiFi, a powerful dual core 1GHz processor, & advanced upstream QoS for optimized game play on consoles like the XBox. When microseconds count, let Nighthawk accelerate your game. For the win. Stop buffering and start enjoying uninterrupted streaming media with features like downstream QoS, Beamforming+ and built-in iTunes server you'll begin to stream like you mean it. Access your stored media quickly with USB 3.0 and keep it safe with free automatic backup software for PCs & Time Machine compatible for Macs. Improve your mobile WiFi speeds by up to 100% with Nighthawk! High-powered amplifiers & antennas help extend WiFi coverage throughout large homes & even backyards. Beamforming+ focuses WiFi signals to WiFi devices. With signals locked onto your device, experience what it really means to be mobile! Multi-user MIMO (MU-MIMO) Using multi-user MIMO technology, this NETGEAR router can stream data to multiple devices simultaneously. With MU-MIMO, your Wi-Fi network can deliver faster throughput to every MU-MIMO connected device. That means faster downloads and smoother streaming for your devices. Dynamic Quality of Service (QoS) If you like gaming and streaming videos, then you can benefit from Dynamic Quality of Service (QoS). Dynamic QoS automatically prioritizes bandwidth to latency sensitive applications like online gaming and video streaming by recognizing application and device information as well as bandwidth needs. Dynamic QoS will also ensure that lower priority applications like file downloads will never get completely stopped. Tri-Band Wi-Fi Tri-Band Wi-Fi with Smart Connect changes the game for today's home Wi-Fi networks. With one 2.4GHz band and two 5GHz Wi-Fi bands to work with, the X6 has the capacity, flexibility, and intelligence to assign each device to the Wi-Fi band where it can connect at its maximum possible speed. The result is that faster devices can connect and perform unhindered by slower or older devices - meaning ALL devices load, stream, and game at their maximum speed. More Wi-Fi range for more devices Keep your mobile device connected throughout your home with powerful amplifiers and 6 high performance external antennas. Roam freely and enjoy strong Wi-Fi coverage and performance anywhere in your home. The 6 antennas deliver the breakthrough X6 Tri-Band Wi-Fi and Beamforming+ focuses Wi-Fi signals creating stronger and more reliable connections for all to enjoy. ReadySHARE USB - ready to store and share ReadySHARE USB opens up a powerful set of convenient features like USB storage access and streaming media. With the available USB 3.0 and USB 2.0 ports on the X6 you can connect the USB storage you already own and enjoy high-speed access via Wi-Fi. Safeguard your files with no worry backups FREE ReadyShare Vault PC software it there for you to schedule automatic hassle-free backups to safeguard precious photos and files from any PC directly to the connected USB storage. ReadyShare Vault is FREE to download and use with your Nighthawk X6. Better processors What could you do with more speed? More power? 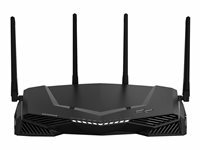 With a fast dual core processor and three offload processors, the Nighthawk X6 delivers faster Wi-Fi speed, faster wired speed, faster USB access speed, and faster WAN-to-LAN speeds meaning faster overall network speeds than ever before. So go ahead and put this network to the test in your home. 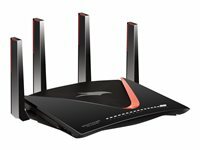 The Nighthawk® X6S AC4000 Router, with breakthrough Tri-band WiFi and multi-user MIMO (MU-MIMO) is ideal for simultaneous streaming to many WiFi devices in your home. The X6S offers the fastest combined WiFi speed up to 4Gbps, and is powered by a powerful 64-bit, dual core 1.8GHz processor with three offload processors. Enjoy fastest WiFi speed throughout your home with less lag and less buffering as you game, stream and surf. Access and control your router from anywhere using features such as NETGEAR genie® remote access, ReadyCLOUD® and OpenVPN®. Control your home network with voice commands using Amazon Echo/Alexa. 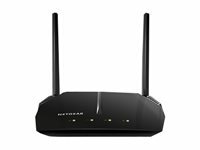 Nighthawk X10 AD7200 Smart WiFi router is industry’s fastest router for media streaming with Plex media server. 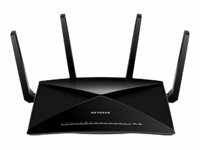 Nighthawk X10 with 802.11ac and 802.11ad WiFi technology delivers ultra-smooth 4K streaming, VR gaming and instant downloads. With a powerful 1.7GHz Quad-Core Processor and Quad-Stream architecture, you can enjoy combined wireless speeds of up to 7.2Gbps. MU-MIMO supports simultaneous streaming, while 160 MHz doubles WiFi speeds to mobile devices. Four patent pending external active antennas amplify WiFi signals to maximize range and throughput. Multi-user MIMO (MU-MIMO) Traditional Wi-Fi routers can stream data to only one device in the home at a time. When multiple devices are connected to the router, each device needs to take its turn, and then wait before receiving more data. This can lead to slower network and Internet speeds. Using Multi-User MIMO technology, NETGEAR routers can stream data to multiple devices simultaneously. With MU-MIMO, your Wi-Fi network can deliver faster throughput to every MU-MIMO connected device. That means faster downloads and smoother streaming for your devices. Beamforming+ - for more reliable connections Unlike typical Wi-Fi routers that just blast the Wi-Fi signals in all directions, with Beamforming+ the router & device communicate with each other, so the router can directly beam the Wi-Fi signal to the device. Boosting speed, reliability, and range for both Implicit and Explicit 2.4 & 5 GHz Wi-Fi devices, the result is a stronger, faster, more reliable connection that is locked in even when the device is moved around the home. Stabilize your ping "Anti-buffer bloat" (ABB) is just a fancy way of saying you can create an express lane for gaming traffic. Using ABB and the XR700's quad-core processor to sort through your networking and prioritize traffic, you won't have to worry about lag ruining your day. Kick lag spikes to the curb With Advanced Quality of Service (QoS) backed by a 1.7ghz quad-core processor, the XR700 adeptly prioritizes even the most congested home networking traffic. That means you'll stay in the game and not in the queue. Never fight over bandwidth Now you can see who is using how much of your bandwidth and make adjustments on the fly with the Device Manager. Dial back, enhance, block any device on your home network, even those bandwidth vampires like streaming devices and voice operated home products. Geo-filter Your proximity, to the server you are connected to, can greatly affect your ping and lag. The Geo-filter helps you connect to the optimum server by allowing connection to only the servers that are in your range setting. No more shotty connections to servers hundreds of miles away. Keep your lag low and your servers close. Quality of Service (QOS) Prioritize every aspect of your traffic. Allocate bandwidth by creating an express lane for your gaming devices. Prioritize devices with a drag and drop interface. Streaming 4k? Increase the bandwidth to your smart tv. Have an important teleconference call? Put more into your laptop. Have a competitive match? Allocate more to your gaming device. It's a mouse click away and afterwards you can reset just as easy. The power is yours. Network monitoring Find out instantly who's hogging the bandwidth. Is it cat videos? 4K cord cutting? You can see, the percentage of your internet, all the devices in your network are using. Drill down and view that type of traffic, from social media, video, gaming etc. You can then make adjustments and prioritize if needed. High-performance active antennas Better Wi-Fi coverage & faster speeds throughout your home. Seven 1-Gigabit Ethernet ports (6 LAN + 1 WAN) Aggregate two ports when connecting to compatible switch to get even more wired ports for gaming LAN parties. 10 Gigabit LAN SFP+ port Faster access for incredibly fast data transfer for gaming, media and data backup and streaming. Connect to your NETGEAR SX10 gaming switch using a 10G SFP+ module for lower latency LAN game parties. 60GHz 802.11ad Wi-Fi Fastest Wi-Fi technology for instant downloads and backup. Powerful 1.7GHz Quad Core processor Fastest processor for home router for better 4K UHD streaming, gaming, or anything you throw at it! Two USB 3.0 ports Faster streaming, backup and easy access to your stored media.